The luggage was the solution for carrying supplies and food during travel. In the 19th century, people traveled through steamships and stagecoaches so they carried sturdy and heavy steamer trunks. Then when commercial flights became a trend, people carried the suit-case or suit case, so-called because their luggage carried suits. The 20th century saw the practicality of the wheeled luggage but not everyone was keen on it. Men who carried them were called “sissies” or “women.” Another practical innovation is the lightweight luggage in 2000 when the first luggage made of polycarbonate was introduced. Let’s face it, most people overpack when going on vacation, and if you have a lot of items to pack and/or some oddly shaped items that would fit awkwardly in a suitcase, a duffel bag is the perfect solution. Duffel bags are designed to carry all sorts of gear, particularly if you carry gear for more than one type of sports. The wheeled duffel bag is even better, because since you are likely going to pack it full before you leave, it is simply easier to use. If you pack light, there are small wheeled duffels for your convenience, and with these bags, you can carry them right onto the plane with you without having to check it. Most duffels offer advantages that include oversized, heavy-duty wheels and a sturdy chassis that allow you to pull the bag over almost any type of surface without damaging it, even cobblestone and concrete. They usually have side and front handles that are durable and won’t break; clips that allow you to attach other small bags to them to make your load easier to manage; sturdy zippers that are made for a lot of usage and meant to last a very long time; and straps that allow you to make the duffel a little more compact and therefore easier to maneuver. Because they are intended for outings such as camping and fishing trips, duffels have a more rugged look and are made with an extra sturdiness so they can withstand whatever you do to them. Originally made for the armed forces, duffels are made tough because they are usually purchased and used by people who tend to put them through a lot. Duffel sizes are similar to the sizes of other luggage types, ranging from 30 inches to approximately 36 inches in height. Often, their interiors are measured according to how many cubic inches of materials they hold, and that number can range from 5,300 cubic inches to over 6,700 cubic inches, meaning it is easy to find something perfect for your needs. Duffels are usually made of a very strong ripstop nylon or ballistic nylon, and the internal pockets are usually made of mesh and readily accommodate extra items, especially small items that might otherwise get lost in the shuffle and items that need to “breathe” a little, or even items you just need to access easily and quickly. They are extra sturdy and designed to get banged up a little without ripping or tearing, which is perhaps their best feature. Wheeled luggage is used primarily by traditional travelers, those who are traveling for personal reasons or on business. They usually have a lot of pockets to hold toiletries, medications, etc., and they are designed to handle any type of luggage transport system at the airport. 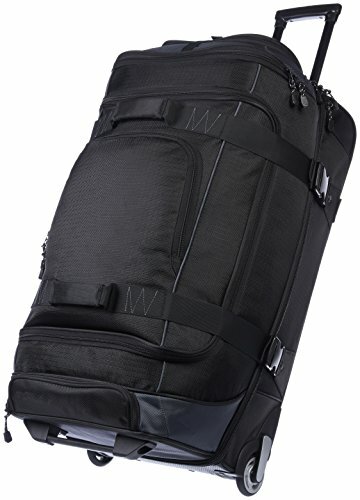 Good for travel to urban areas and road trips, wheeled luggage is a convenient, easy way to get your personal items and clothing from Point A to Point B.
Wheeled luggage is perfect regardless of the type of trip you’re planning, whether long or short, casual or formal, and whether you’re traveling by plane or automobile. It is a good, strong, multi-purpose type of luggage that can be used and appreciated by personal and business travelers alike. 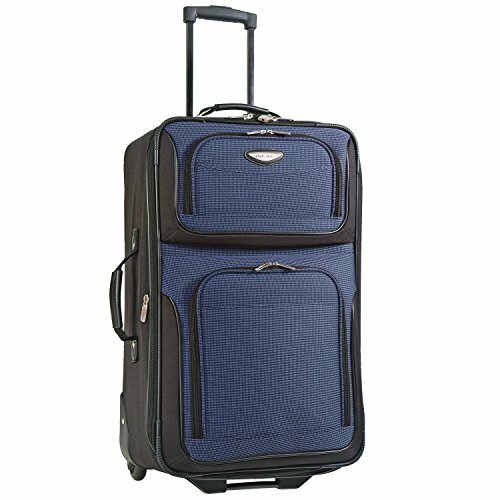 There as just as many sizes of wheeled luggage as there are companies that make this product, but as a general rule, the sizes range from 18 to 32 inches high, and the internal sizes range from 2,200 cubic inches to over 6,300 cubic inches, making them perfect both for those who want to check in the bag and those who intend to carry it on the plane with them. Wheeled luggage usually is made of tarpaulin that is weatherproof and PVC-free. This makes the bag easy to clean both inside and out, and they usually contain mesh compartments on the inside for your smaller items. Even the zippers are usually sealed so that they will last a very long time, meaning you can use the bag for years — even decades — without it breaking. Carry-on luggage is designed for one purpose and one purpose only – convenience. If you are traveling and don’t wish to check your baggage, a carry-on piece of luggage is your smartest option. Since most airlines limit the size of carry-on bags to 22” x 14” x 9” at the largest, carry-on luggage is manufactured within this size range to make it more convenient for you. They are also designed for travelers who tend to pack light, don’t wish to pay baggage fees, or those who are very mobile. Features on a typical carry-on bag include oversized, heavy-duty wheels that can roll over everything from concrete to cobblestone; internal storage pockets for smaller items; external pockets that can fit items such as magazines and snacks; and compression straps on the inside to help secure your belongings so they don’t shift around as much. Most also have ID windows for your identification information and extra-strong grab handles that won’t tear off at the drop of a hat. Carry-on luggage comes in various sizes and colors and with many different features, but they are specifically designed for the light traveler in mind. Their style types are made with these aspects in mind, and most people find this type of luggage is perfect for both short-term and long-term trips. It makes traveling a lot easier and time at the check-out counter a lot shorter, which is a win-win situation for everyone. Overall, carry-on luggage is the simplest type of luggage to travel with for most travelers, regardless of your final destination. Since carry-on luggage cannot get above a certain size, most of it can be found from 18 to 22 inches high, and most of it holds between 2,200 and 6,300 cubic inches of items. Many people find a size that’s perfect for every trip they take, while others use this type of luggage only on short trips where they aren’t packing too many clothes or other personal items. Like other types of luggage, carry-on luggage is usually made of a polyester-nylon combination that is made to withstand anything you put it through, and it is sturdy and weather-proof as well. Some carry-on luggage is made with a hard, shell-like ABS plastic, making it nearly impossible to break or damage. Also like other luggage, carry-on luggage is made in a variety of colors to suit anyone’s preferences and tastes, including hues such as red, purple, and teal. Made especially for basic road trips or more adventurous travel, wheeled backpacks combine the convenience of a wheeled bag with the functionality of being able to throw it over your shoulders whenever necessary. If you’re in the airport and suddenly come across an escalator, just throw it on and step onto the escalator for easier movements up and down the stairs. They are also perfect when you have a long way to walk or you’re in the middle of heavy foot traffic, because they can be lifted off of the ground and allow you to maneuver through the crowds without a problem. Much like regular luggage, rolling backpacks come with features that include inside straps to hold your items in place, heavy-duty zippers that are made to last, and mesh pockets to carry smaller items and items you wish to access once you get to the airport. They can also include special pockets for cell phones and music devices, as well as a sturdy telescoping handle that is reinforced with a rubber grip. Wheeled backpacks are made for convenience, but their mobile size doesn’t take away from the fact that they are sturdy and reliable. Wheeled backpacks come in a wide variety of styles, and because they are often used by children, they can even come in bright, colorful designs, as well as a variety of kid-friendly patterns that can include graphics such as animals, sports, school-related items, hearts, flowers, and geometric designs. They are aesthetically pleasing and useful at the same time, making them valuable regardless of your age. As most people are aware, wheeled backpacks are perfect for people who wish to pack lightly but still be able to carry their luggage around like a regular backpack. 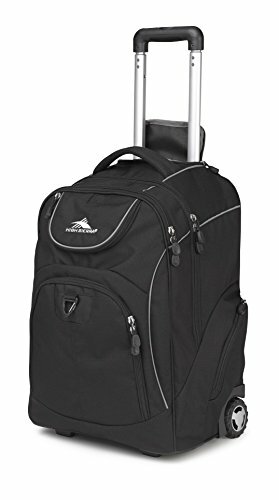 They are easy to use and extremely convenient, made to last and very attractive, not to mention more reasonably priced than many other types of luggage, which is yet another advantage to choosing a rolling backpack. Even though they are made to be carry-ons and conveniently carried around, wheeled backpacks are still able to hold a lot of items. They usually have interiors that are 40 to 42 linear inches in size, and they can range from 17 to 21 inches in height, making them the perfect receptacle to carry almost anything you need packed for your next trip. Although wheeled backpacks can be made of various materials, they are almost always constructed of a soft but strong material such as nylon or polyester, or a combination of several different materials. Because of their size, they are rarely made of a hard material, although if you look around you may be able to find one like this.. The amazing part about shopping for sleeves and bags for tablets and laptops is the selection that is available, which is much greater than most people realize. 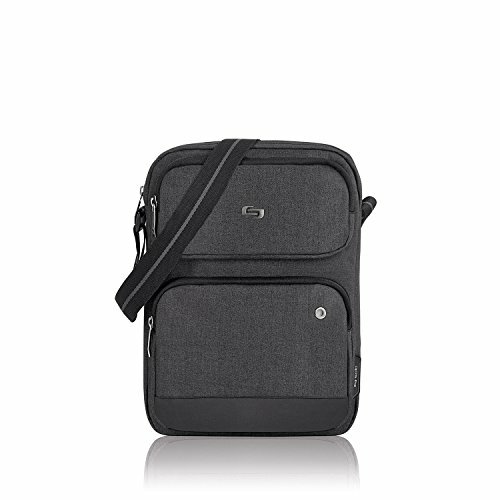 Luggage-type bags that are made to protect laptops and tablets are made of various types of materials, and they come in designs that include sleeves of various sizes, bags, backpacks, rolling laptop bags, and cases and bags made specifically for various sizes of tablets. Whatever you’re looking for to protect your laptop or tablet, you can easily find it, especially if you search online, and they come in a variety of colors as well. Perhaps the thing that makes these items stand out some is the fact that each one seems to be a little different than the last, and they can include straps to place the bags across your shoulder and therefore make them easier to carry, handles that make it simple to hold the bag like a purse or small suitcase, zippers that make it easy to get in and out of the bag, pockets that allow you to carry items such as pens and business cards, and sometimes extra features such as flaps that allow you to store pens and pencils on the outside of the bag so that you can easily get to them when you need them. Whatever convenience you are looking for, chances are good you’ll find it when you’re searching for a laptop or tablet bag, especially if you shop at the more reputable stores. Laptop bags: these come in sizes that range from 10 inches to over 17 inches and come with or without handles, as well as in a wide variety of colors, patterns, and designs. Laptop backpacks: made slightly larger than regular backpacks, these items have extra pockets for paper and anything else that you might need once you set up your laptop to use. Laptop sleeves: these are flat cases that come with or without handles, pockets, zippers, and straps, so you can purchase them as standard or as fancy as you like. Rolling laptop cases: a little larger than laptop bags, these have plenty of room for your laptop and the accessories that go along with it, making them very valuable especially if you travel a lot. Tablet cases and bags: a variety of products made specifically for your tablet; they almost always have the capability of being folded out to produce a stand so that you can set it up on a flat surface and view it without having to hold it in your hands. Of course, the main purpose of these bags is to keep your tablet or laptop both safe and separate from the other items you’ve packed, making it easier to access them while you’re waiting to board your plane or once you get in your seat. This is likely the main reason they come in so many sizes and styles, because each user is going to have different needs and different reasons why the bag was purchased in the first place. Many of them are also small enough to carry with you even if you have additional luggage, and because they are made specifically to protect electronic devices, even if you drop it you’ll know your laptop or tablet is going to be protected. They are especially useful for business travelers who need to be on their device while in the air, because the cases are usually the perfect size for unpacking and repacking your device with ease. Because laptops and tablets come in so many different sizes, the bags that protect and carry them are also available in numerous sizes. From cases that just hold the device itself to those that hold other items as well, they can be thick or thin, small or large, plain or containing straps and pockets. In short, you can get whatever size you need and make it as standard or as fancy as you like when shopping for these cases. More than most other types of luggage, bags for tablets and laptops come in so many different sizes that it is impossible not to find something that is just right for the device you own. Laptop and tablet containers can be made of vinyl, polyester, or some type of blend, but many are also made of neoprene. Their materials are always strong and sturdy but lightweight, because the bags need to be made of something versatile that makes them easy to carry around and easy to open and shut numerous times during each trip. Duffel bags come in a wide variety of designs, but they do not have the pull handle or wheels that their rolling counterparts do. They are designed to be very easy to carry around, which is why they normally have handles attached to them, and they are also easier to store and have no rigid parts, folding up very small so you can stow them in an area with limited space. They are designed not only for climbers and college students but also for those on a budget, since duffel bags of all sizes tend to be very inexpensive. There are dozens of types of duffel bags, but most of them have one or more of the following: strong straps to make it easy to carry, heavy-duty zippers that are meant to last, outside pockets that allow you to store even semi-large objects in them, and reinforced insides so they are even more difficult to destroy. Duffel bags come in many different styles because they are used for so many different purposes. They can be long and tubular-shaped, tall and fat, or shaped just like a regular backpack or luggage piece. Since they are often used by members of the armed forces, they come in enough styles to suit all of their needs, and this is another reason they are so well-made and strong. The main purpose of a duffel bag is ease of use and the assurance that you can put it through almost anything and it is going to last. If you tend to be rough on your luggage, a duffel bag could be the perfect solution, and because they’re available in so many design, color, and size options, you can also easily get something you find attractive. Since duffel bags come in so many shapes, their size dimensions often look similar, but the larger duffel bags can have up to 8,000 cubic inches of space on the inside. They can be tall or short, round or rectangle in shape, and come in so many sizes and shapes that it is impossible not to find something just right for your needs. 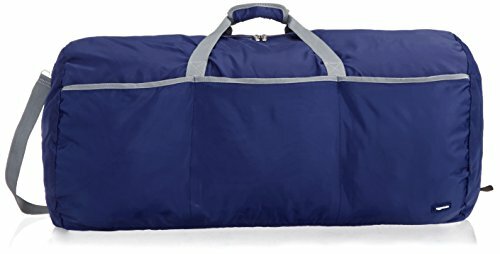 Duffel bags are also made in sizes that make it convenient to carry them around regardless of the length of the trip or even how easily you want to get around the airport or other location you’re in. If you need to move quickly through the crowds, the last thing you want is a big, bulky, heavy bag that you have to carry with you the entire time, because it can definitely slow you down. A duffel bag is the easiest way to pack everything you’ll need for your trip and have a piece of luggage that is the exact size you need without being too large or cumbersome. Like most other types of luggage, the material used in duffel bags can include polyester, vinyl, and many types of blends, but duffel bags can also be made in canvas. Canvas is sturdy and reliable, and it is nearly impossible to rip or tear. Canvas also comes in a wide variety of colors, and even if you drag around a duffel bag made of canvas, including hauling it across the floor, it should last just fine throughout your trip. It is a very thick material, so it does an excellent job of protecting everything on the inside of the bag, and it is practically impossible to destroy, making it the perfect material for duffel bags.